Bentley is known for its big grand tourers packed with massaging seats and ludicrous W12 power. Looks and features are cool and all in the abstract, but does this new 2019 Bentley Continental GT actually grant you a luxurious enough experience in the cockpit and good enough handling on a fun road to justify the price tag that matches a nice house? 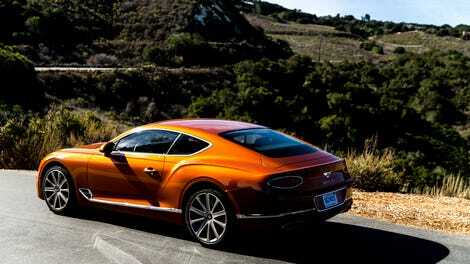 The Bentley Continental GT is a 2+2 grand touring coupe, way at the top of the car food chain. Built in Crewe, England, and based on VW Group’s MSB platform—which also underpins the brilliant Porsche Panamera—the Continental competes with the Mercedes-Benz S-Class Coupe, Aston Martin DB11, and Ferrari GTC4 Lusso and Portofino, which all play in the over-$200,000 big GT space. Just to be clear, 2019 is a big jump for the Conti GT. Last year’s model that I drove was still based on the original’s platform, which has roots in the VW Phaeton from the Bush Administration. For 2019, Bentley brings its third generation Continental GT to the four-car garages of the super rich, likely to end up at a valet line near you. But more people need to take them seriously. Plenty of updates have been made to please the driver who either wants to cruise along in luxury and for the driver who wants to hoon. You get a hint of it in the sharpened exterior, all tight lines that quickly catch your eye. Bentley models are always packing some heat, and the new Continental GT boasts an updated 6.0-liter twin-turbocharged W12 engine that delivers 626 horsepower and peak of 664 lb-ft of torque across the range of 1,350 to 4,500 RPMs. Twisting power through an 8-speed ZF transmission and all-wheel drive, the Continental GT surges from 0-60 MPH in 3.6 seconds on its way to a supercar-level top speed of 207 MPH. The Continental GT has a base curb weight of 4,947 pounds—hey, that’s still about 150 pounds lighter than the 2018 model I tested—tucked into its 190-inch long, 76-wide, and 55-inch tall body. 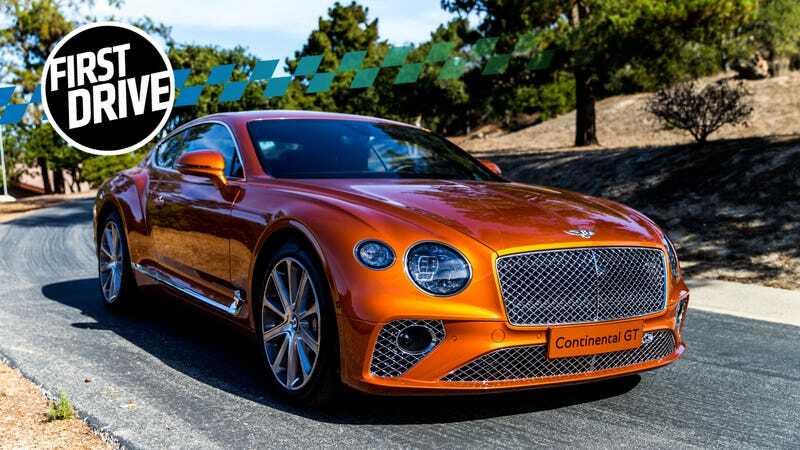 Oh, and on the topic of price, the Continental GT has a base MSRP of $214,600 but we all know no one gets a base-equipped Bentley, and my Orange Flame tester’s $269,325 MSRP indicates just how well-optioned one can go. Few cars can contend with the interior of a Bentley. The seats have a handful of massage modes, the adaptive suspension reacts to any road condition to keep you perfectly stable, and the cabin surrounds you with fine stitched, quilted, knurled materials. These are things you expect from Bentley. What’s less expected is how complete the driving experience is on a backroad or a cruise. My test car was equipped with the optional Bang and Olufsen audio system packing a damn near overwhelming 1,500 watts of sound through 16 speakers, and what B&O call “BeoSonic, an intuitive ‘One Touch User Experience’” which is simply one of the best audio systems I’ve ever heard in any new car. If you’re tired of looking at the stunning new touchscreen display, the Bentley Continental GT now features a $6,270 optional Bentley Rotating Display feature, which conceals the screen, and displays a panel to match your interior veneer trim option. Very classy. The revised W12 engine now boasts direct injection, variable displacement, and stop-start to make that big power plant more civil and efficient. EPA fuel economy figures weren’t available at the time of publication, but the old 2018 W12 got 12/20 city/highway MPG, so I’d expect this to go up just a tick because of the improved engine tech. The back seats are decently-sized for real adults to ride in reasonable comfort, but the front buckets are where you want to be. Rarely have I spotted a Continental GT with more than two occupants, but I imagine this happens. If you’re looking to take your friends along in a Bentley, you’re gonna get kicked up to a sedan or the Bentayga. This is a nearly 5,000-pound car. And yet along Laureles Grade and Carmel Valley Road, the Continental GT felt at home. With the 48-volt Bentley Dynamic Ride adaptive suspension hidden beneath the surface, the Continental is glued to the pavement while gently soaking up any tiny twig or pavement bump it may encounter. Equipped with an adaptive air suspension with three-chamber air springs and continuous damping control, cornering is supremely flat, and there’s only the slightest hint of understeer. That isn’t really a complaint. This is two-and-a-half tons of car with all-wheel drive, so one should expect a hint of push in the faster bends. Wheel inputs are light and easy, but not too vague. Feedback you get from the 21-inch Pirelli P-Zero tires is great, and while they did make a slight bit of noise when I was more earnestly pushing faster through the curves, not once did I feel that the rubber was going to lose grip. Having over 600 HP at your beck and call doesn’t hurt either. If a slow-moving RV or minivan on a winding road through Northern California ends up in front of you, they won’t be impeding your progress for long. Any application of the Bentley’s go pedal is directly received, and your acceleration addiction is granted a healthy serving of boost-fed power. Surprisingly, the delivery of all those 626 horses is easily manageable. I’ve driven plenty of big cars with this much power on tap, and not once did I feel like mashing the gas provided a rush of speed I wasn’t prepared for. One could attribute this result to the logic in the drivetrain and that wonderful ZF 8-speed automatic. I was sure it was a dual-clutch until I double checked the specs. The total package is really well sorted out. When flinging the GT on any road, I’m pleased how similar the handling and power delivery is to much smaller and lighter performance coupes. Sure, there’s way more weight and size than a Porsche 911, but the Continental is still damn enjoyable to flog. I say this having driven a fair number of 911s, on roads just like these. The outgoing Continental GT was quite satisfactory, but I mentioned in my review earlier this year that the interior was dated. Bentley definitely stepped up its game in quality, style, and ease of use throughout the interior. The touchscreen controls are clear, the UI is clean and intuitive, and every single touch point is well-placed and designed. It’s astoundingly good inside that cabin, and will definitely age well. I’m not in the minority when I say that Bentley have some good looking rides, and the new Continental GT is achingly stunning. Utilizing superforming to craft an entire body side in one well-sculpted aluminum piece, sharper lines and angles are easier to achieve. The proportions are well-balanced, and the creases and character lines are now more pronounced than the 2019 Continental’s predecessor. From the bigger, more impactful grill to the swiftly swept front lights into the front fenders, I love this new packaging. Dialing in all the settings, or not getting distracted by the options can be an issue. There are more than 20 ways to adjust the front seats, five massage modes, three heating and cooling options for the seats, plenty of exterior and interior mood lighting setups, dozens of screens to navigate for your perfect personalization, and four drive modes—including a custom setup mode—to suit your demands. If you aren’t totally focused on the road ahead, and have everything perfectly set up to your liking, you better hope there isn’t a hint of A.D.D. in your system or you’re going to be tempted to play with a screen or switch every three seconds. If you’re looking into any Bentley to fill a space in your five car garage, price isn’t anything to worry about. You’ve got the spare coin to throw about. At $269,325, the Continental GT I tested costs more than the average American home, but the marketplace shows there’s plenty of demand the wildly expensive cars and SUVs we see so many of on the road. The trouble is that most of us can’t get anywhere close to one of these, which is unfortunate because the car is such an epic experience. Having only a short time to shake it down, I walked away impressed. I loved the 2018 Continental I drove earlier this year, but I got to spend a good week in that one. I keep plugging on about how great a grand tourer this 2019 Conti feels like it would be, but I’d need to get one for a long, scenic road trip to know if it stacks up. Maybe in the next few weeks I’ll scoop one up after I’ll inherit the estate of a long-lost tycoon uncle, or knock over a bank. I’ll keep you posted. Frankly, Bentley continues to deliver a package of luxury and performance, as expected. The 2019 Continental GT definitely brings their game to another level, and I’m glad I got a quick chance to check it out. Being treated to the pinnacle of cabin appointments and comforts while blasting away on a long highway or through a curvy mountain pass is best done in a Bentley. If you’re trying to decide between that third house, a bigger yacht, or an insanely good grand touring car, go talk to your local Bentley dealer. Any more leather would cause a global shortage. This much weight shouldn't drive this hard.